The first thing I notice is the urge. I’m craving yoga right now in a way that I haven’t in years. It reminds me of my first year of practice: I’d go to sleep every night, giddy with anticipation knowing I’d get to roll out my mat the moment I woke up. Every day was like Christmas morning. That feeling of excitement lasted about a year before routine took over and yoga became just part of my normal. I turned my yoga practice into teaching, and teaching into a career, and along the way I stopped feeling like I was unwrapping a gift every time I’d begin my practice. Yoga stayed important, but it stopped feeling like Christmas. I had a baby, and in a way I get to start from scratch; I get to be a beginner again. That’s the second thing I notice: I’ve been given the gift to get to know my body once more. It’s different now compared to a decade ago. Then, I was 20 pounds lighter. My body was lean, fit and strong without ever having to try. I was all sharp angles and muscle, and I was learning how to invert and balance on my hands so much that I probably spent more time on my hands than on my feet. My yoga practice was like my body: firm and determined. Now… My body is soft in the most beautiful way. It’s like I have an extra layer of insulation cushioning me from the roughness of the world. Because I had a baby, and babies need soft things. So, my body has adapted. Where there were once edges, there are now round hips and thighs. Because of this new body, everything is different in my practice. I’m moving from a new place. Even though the feeling is the same as that very first year – I’m giddy with excitement to get on my mat – I’m getting to know a different body. This body is a body that’s lived. It’s a body that’s birthed. It’s a body that’s carried the weight of pain and the lightness of joy and everything in between. It’s a body that’s busy nursing a child! What’s more magical than a body that created, carried, delivered, and now feeds a brand new, tiny human? I still can barely wrap my head around it. This body doesn’t care much about balancing upside down anymore. Because for the first time the world is right side up. Lea Luna is here, and the love she brought with her has made its way into every inch of who I am. She’s changed me in all of the most magnificent ways there ever could be, body included. Lea Luna as my teacher, I’ve arrived at a new place where there is nothing left to prove. Wow, that feels good to realize! My mind says it again to make it sink in deeper - there is nothing left to prove. Without the need for improvement, this body doesn’t have to be strengthened, contorted, fixed or altered anymore – it just needs to move the way it longs to move. It just needs to be. Today, on my mat, I breathe deeply into this new softness in and around me. It’s Christmas morning, but the gift feels different than it ever has before. It feels like something even more profound. That’s the shift: I’m bowing to the immeasurable beauty of my own skin - exactly as it is. Thank you, yoga, for welcoming me back as I am. Even though my body is different, I know you will guide me along a beautiful new journey, as you always have. It’s damn good to be home. Today, I want you to let yourself do the same. What part of your perfectly created, immeasurable magic will you bow to? Tell me in the comments below! 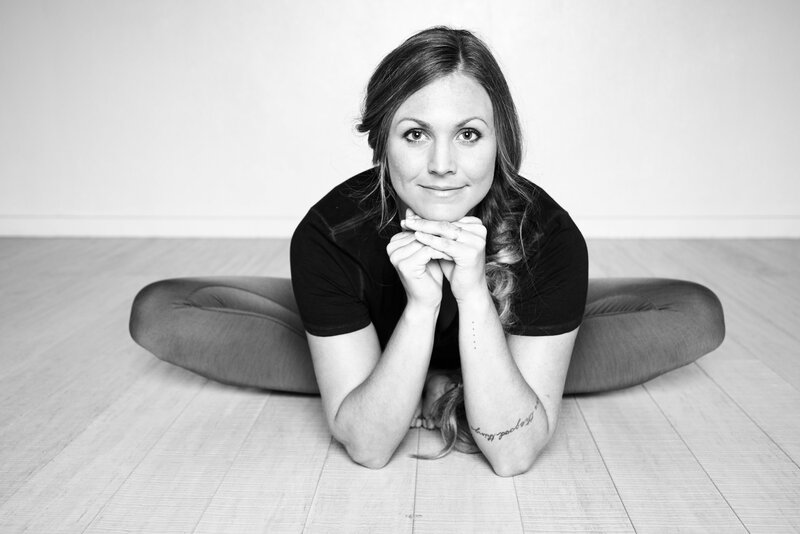 PS: There are amazing yoga guides that will ease you back into your own practice (or start it!) on oneOeight.com. Pre and postnatal moms - I’m talking to you!